No copy paste needed to save images of pdf document, extract out all the images in original format automatically. Program is very robust & Windows OS compatible, takes bulk pdf for processing & exports all photos in their respective folder. Using this application, you can extract JPG, GIF, BMP, & TIFF bitmaps in original size & file format. Free evaluation copy is also available to see the demonstration of actual product. The only limitation is that trial version display watermark on output images. 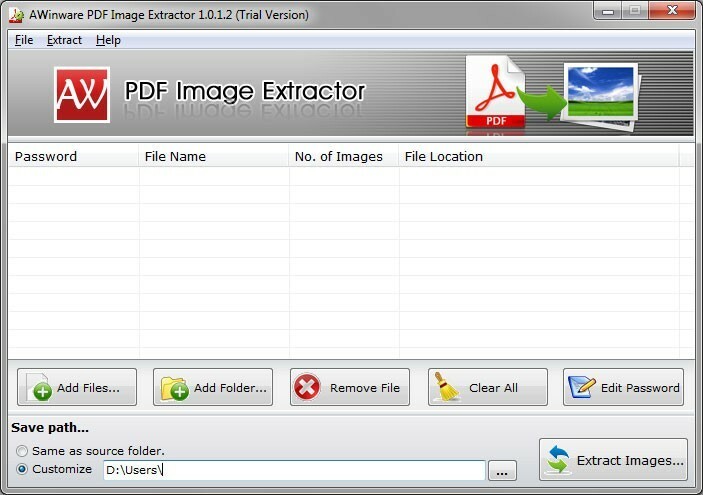 Program follows few simple steps in extracting pdf images, import one or more pdf into program list, set pdf output location, and click to extract image.